The product comes in 0.5 oz. bottles and may have higher concentrations of the drug than it should. 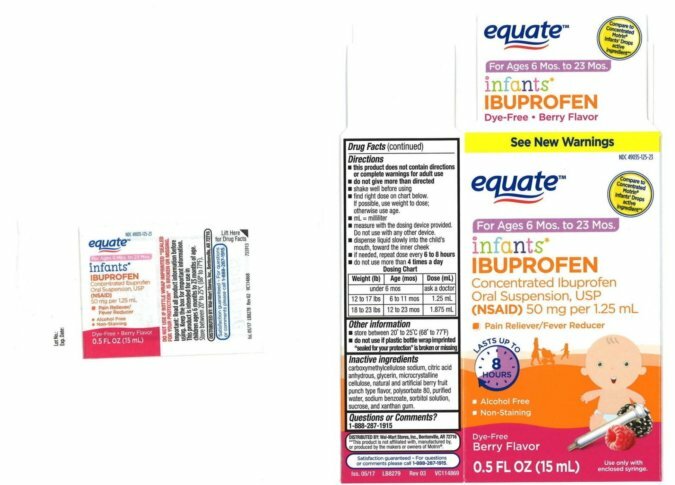 WASHINGTON — A New Jersey-based pharmaceutical company issued a recall on Wednesday for three lots of liquid ibuprofen for infants. Tris Pharma, Inc., said its pain-reliever/fever reducer was sold to one customer and then packaged for sale at Walmart, CVS and Family Dollar. The product comes in 0.5 oz. bottles and may have higher concentrations of the drug than it should. The company has not received any reports of problems related to the products under recall. If infants ingest too much ibuprofen, they can suffer from nausea, vomiting, gastric pain or diarrhea. They also may suffer permanent renal system injury related to ingesting too much of the NSAID. More information can be found by reading Tris Pharma’s news release. A list of the recalled products can be found below. Consumers concerned about a product they may have recently purchased can call Tris Pharma’s customer service number at 732-940-0358. Parents who believe their child may have ingested too much of the drug should call their physician or health care provider.